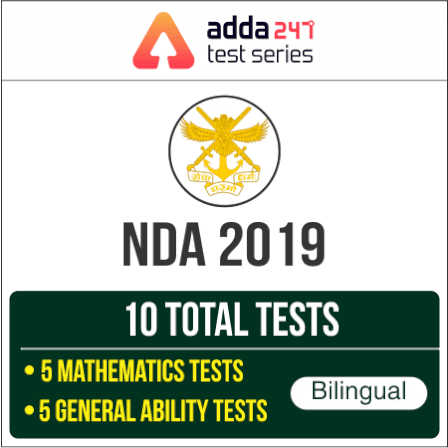 Dear Students, Defence Adda is providing you all with this quiz on English Language questions for NDA and other Defence Examinations. One can attempt the maximum number of questions in the minimum time in the English Language section of defence competitive exams. If you have the basics of the important topics of English all groups, you can definitely score good marks in the upcoming defence examinations. Practicing daily with daily quizzes on Defence Adda not only ensures good marks in this section but also strengthens your chances of getting through the above-mentioned defence examinations. Direction (1-10): Each of the following question consists of a word in capital letters, followed by four words or group of words. Select the word or group of words that is most similar in meaning to the word in capital letters. Sol. Digress: to deviate or wander away from the main topic or purpose in speaking or writing. Deviate: depart from usual or accepted standards. Hence the correct synonym is Deviate. Sol. Contend: to strive in rivalry; compete. Competing: strive to gain or win something by defeating or establishing superiority over others. Hence the correct synonym is Competing. Sol. Salubrious: favorable to or promoting health; healthful. Hence the correct synonym is Healthy. Sol. Preposterous: contrary to reason or common sense; utterly absurd or ridiculous. Farcical: relating to or resembling farce, especially because of absurd or ridiculous aspects. Hence the correct synonym is Farcical. Sol. Congenital: (of a person) having a particular trait from birth or by firmly established habit. Inherent: existing in something as a permanent, essential, or characteristic attribute. Hence option B is the correct synonym. Sol. Reprisal: (in warfare) retaliation against an enemy, for injuries received, by the infliction of equal or greater injuries. Retaliation: the action of returning a military attack; counter-attack. Hence option D is the correct synonym. Sol. Quagmire: an awkward, complex, or hazardous situation. Imbroglio: an extremely confused, complicated, or embarrassing situation. Sol. Decadence: moral or cultural decline as characterized by excessive indulgence in pleasure or luxury. Ascent: an advance in social status or reputation. Transient: lasting only for a short time; impermanent. Massive: large and heavy or solid. Hence option C is the correct synonym. Patch: treat someone's injuries or repair the damage to something in an improvised way. Hence option A is the correct synonym.